The Queen received the President of Croatia at Buckingham Palace. Later, she hosted a garden party, accompanied by other members of the royal family. It was a day of favorites, starting with the Aquamarine Clips and moving on to the Jardine Star. I do so love her in pink. 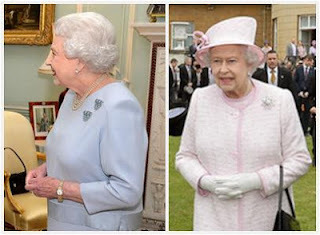 Also, HM held an investiture at Buckingham Palace yesterday, though I have not seen anything to give a brooch hint.